Right now you are probably thinking to yourself, "I really thought she would title this 'Sew Fun, Sew Productive.'" I thought about it. I planned on it. But it seemed so predictable. And really, although my blogging friends and I say quite often, "It's all about the title and the comments" (oh yeah, and good content and readership...), being a little unpredictable is a good thing. So Quilting in the Pines. It was so fun and quite productive. Although after sewing and sewing little tiny half-square triangles and getting only FOUR blocks done from Thursday at 1 p.m. until Friday at 8 p.m. (!! ), I was not feeling very productive at all. And for the quilt top I was working, there were still two more blocks to go. So...I scrapped (ha!) that idea and moved on....to a cute little baby quilt. Now, I'm pretty sure the future recipients of this quilt are not readers of this blog, but just in case they occasionally pop in, I will share just a corner of the quilt. The fabric I was working with had the cutest little tape measures as part of the pattern, so I cut them all out and included them as a border. On a couple of sides I pieced together a bunch of them so they actually measured from 1 inch to 25 inches. Weirdly, in the fabric that I had, they started at 8 inches, went to 25 inches, and then started at 1 inch. Anyway, Mom and Dad will have a handy-dandy measuring tape just in case they want to know how much Baby has grown in a day or two. That quilt seemed to go together lickety-split. So then I moved on to....more little tiny pieces (which will eventually be little paw prints). This quilt is for Levi. This will be his second quilt, although he hasn't received his first quilt yet. The first quilt is the one I take a lot more time on, not that it is heirloom quality or anything like that, but I try to make it really special (note: I haven't even started working on it yet, but I do have a plan). The second quilt is made to just throw on the floor or cuddle. And although I really think this quilt top is going to be GRRRRREAT (think Tony the Tiger) because it is made from wild animal prints, the reason I am making it is because of the back. I found the softest Minkee in four different wild animal prints for the back. I wish you could feel this stuff through the computer monitor. So I don't know...the back could theoretically turn out to be the front, because it is amazingly soft. 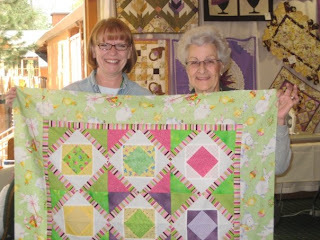 There are just so many amazing quilts being made. It is fun to just wander around and see what everyone else is working one. Imagine my surprise (and delight, to be truthful) when I walked past a stack of blocks that looked like they were being made with my pattern. I looked on the other side of the sewing machine, and there it was. When this person was all done putting the quilt top together, we got a picture of it. And Jennifer had even made a miniature version of it. Jessie, our "quilt camp newbie," worked all night (I'm not kidding--5:30 a.m.!) to finish her quilt top. And then she was the winner of the grand door prize. A good weekend for her. I think she'll be back. Sew...(hey, I warned you this would happen in a previous post), it was a great weekend, spending time with my best friends, sewing, laughing and eating. Can't wait to do it again. And yeah, all we have to do is practice our kicks and I'm sure the Rockettes will be giving us a call. Levi can't wait! Well, at least Mom can't. I'm impressed! All those teeny little perfect triangles... I sew too, but the precision quilting calls for scares me silly. Beautiful stuff! Seeeew I kind of missed the "Sew" haha. We did have such a great weekend!I think I will be going back.